For those of you who love Civil War History, here is a story ssociated with the Confederate Privateer Jeff Davis. Thanks to Mr. Tim Jackson, a LAMP volunteer for this interesting info. The Brooklyn Daily Eagle is available on-line. The Brooklyn Daily Eagle was published between 1841-1902. I will warn you that some of the descriptions on the web from the 1861 papers are very graphic. My snip below stops short of that. The website is: http://eagle.brooklynpubliclibrary.org/Default/Layout/Includes/BE/NavigationSites/Phaseone.htm. The (parenthesis) include my notations. On July 25, 1861 the Brooklyn Daily Eagle Reported. The narrative goes on to describe how the prize crew of the Jeff Davis were killed with axe blows to the skull and dumped over board. 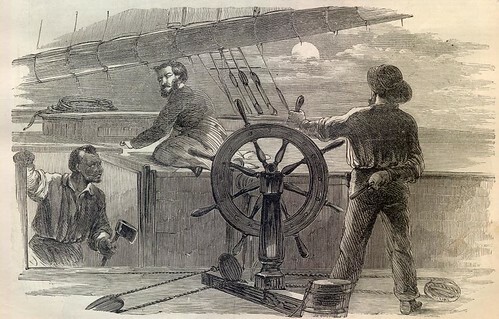 Then Tillman, without any real training in navigation steered the Waring back to the port of New York. With publicity like this, it is no wonder that the Privateer Jeff Davis was infamous by the time she sank on the bar just off the St. Augustine Lighthouse!! " "Professor Anderson, Jr, the Greatest Wizard of the World, gives his wonderful feats of magic and Necromancy every afternoon and evening." The museum and attraction industries have come a long way since, as have our notions of human and civil rights!!! Howvever, this look at the Victorian culture is indeed fascinating for the historian and obeserver of social history.